OCLC’s Regional Council Meeting for members and customers in EMEA (Europe, Middle East, Africa) took place over the 26 and 27 February in Strasbourg this year. I had the opportunity to attend as I was asked to contribute to a workshop before the start of the conference proper on CONTENTdm, OCLC’s digital asset management system. We have been using this successfully over the last few years for our My Leicestershire History Website. The workshop was very practical with a number of people like me outlining case studies of using CONTENTdm. We all agreed that it is an easy system to get to grips with but, like any system, has its limitations – one of which is “customisability” (especially if you are using the hosted service). The theme of the conference was sharing data which – given the context – largely, though not exclusively, meant sharing library metadata in new and more efficient ways to increase the visibility of ‘library resources’ on the Web and provide new services. The programme opened with an excellent presentation from Jean-Baptiste Michel of Harvard University on how he and colleagues have used a huge dataset derived from Google Books to analyse the changing prevalence of words. The resulting dataset is well known and can be queried online. It vividly illustrates the power of large scale data analysis – in this case, using data not originally created for this purpose. It also illustrates how important re-use of data is to enabling new kinds of research. The team at Harvard are now moving on to use Open Library, JSTOR, the New York Times and arxiv.org as further sources of word occurences for analysis. Michel saw potential for libraries to develop services in this kind of area – providing tools and support to enable researchers to analyse data in new kinds of ways. Roy Tennant, Senior Program Officer at OCLC, then outlined how OCLC is working to make WorldCat a source of linked data on the Web, thereby opening up access to library resources at ‘Web scale’ level. This presentation demonstrated how important persistent identifiers are in the linked data world and the challenges of creating and maintaining them. How do you identify an author uniquely and persistently, for example? Good old library authority files are being seen in a new light in this regard with OCLC, national libraries and others working together on the OCLC hosted Virtual International Authority file initiative. The Library of Congress is now working on a linked data model as part of its BIBFRAME initiative. A presentation from Marie-Christine Doffey of the Swiss National Library illustrated that open licensing and harvesting of metadata is now mainstream activity for European national libraries. Jay Jordan, CEO of OCLC, spoke about OCLC’s new ‘Web scale’ platform for libraries – WorldShare. Continuing the theme of identifiers, his presentation included mention of OCLC’s involvement with development of the International Standard Name Identifier system – ISNI. And, as regards researchers, there is also, of course, ORCID. Most WorldShare sites are currently in the US or Australia. A first site is about to launch in the UK – at Bishop Grosseteste University. (p.s. A first set of presentations has now been made available on YouTube). I attended a joint BIALL (British and Irish Association of Law Librarians) and CLIG (City Legal Information Group) seminar on EU (European Union) law held at Field Fisher Waterhouse in London on 10 December 2012. Rather aptly, the course occured on the same day as the European Union was awarded the Nobel Peace Prize 2012. Maria Bell (EDC and Law Librarian at the London School of Economics) provided an overview of the formation, history and enlargement of the EU and its main institutions. The European Council and the Council of Europe should not be confused. The Treaty of Lisbon (2007) has renumbered the founding treaties again. Directorates-General (DGs)are EU government departments. Maria also provided an overview of EU legislation. Primary legislation are treaties; and secondary legislation are regulations, decisions and directives. There are also non-legislative acts (non-binding recommendations). Regulations and decisions apply directly; but directives require national implementation. There is no easy way to trace national implementation of EU directives: Eur-Lex includes some National Execution Measures (MNEs), and N-Lex will link you to national legislaton websites (in national language). The last resort is to see if the EU has started proceedings against member states in the ECJ for non-implementation of legislation. Pre-Lex (from European Commission) and the Legislation Observatory (OEIL) (from European Parliament) enable you to trace draft EU legislation (similar to a UK bill tracker). David Percik (Library Manager BPP Waterloo, and formerly EU Librarian at the Law Society) provided an overview of the EU courts and case law. The two major EU courts are: Court of Justice (ECJ) (C-cases) and the General Court (T-cases) (formerly the Court of First Instance). There is also an EU Civil Service Tribunal to adjudicate in internal employment disputes. Do not confuse the European Court of Justice (ECJ) with the European Court of Human Rights (ECHR). The ECJ will give preliminary rulings (advice to national courts on EU law), infringements (non-implementation of EU law by member states), and annulment / failure to act (judicial review of EU law). After application to the court, the most important stage is the written stage, whereas oral stages (hearings) are optional. The Advocate-General (AG) will give an advisory opinion, and the Judges give their judgment later. Judgments are published on the ECJ website on the same day, but are not official until they are published in the European Court Reports (ECRs), often with a considerable time delay. Although EU case law is available on Eur-Lex, David recommends Curia as a better source, because of enhanced search interface. Els Braedstreet (European Commission Publications Office) provided an introduction to the new Eur-Lex database (currently testing in beta-version). Most significantly, the new Eur-Lex will bring together Eur-Lex and Pre-Lex, to give a single source for draft and in-force EU legislation. The new Eur-Lex will include a new search engine, and enable a full customisable service. It also makes use of web 2.0 technologies to provide updating services. It looks to be a great improvement on the current database, and I can’t wait for it to go live. Eur-Lex are actively seeking users to join their test-panel, and particular welcome interest from academics and students. Email eurlex-helpdesk@publications.europa.eu for further information and to join the test-panel. The seminar provided a useful refresher to EU law, but I did not make any earth shattering discoveries, so perhaps I know more about EU law than I credit myself with? No fancy lunches to report on this time, although chocolate biscuits were provided with the refreshments. I had to satisfy myself with a toasted panini for lunch, as the cafe had sold out of the soup I so deperately craved to warm me up on a chilly December day. Finally, a personal highlight was seeing of few of the capital city’s iconic sights for the first time, located conveniently close to our host venue: Tower of London, Tower Bridge, the Gherkin and the Shard. 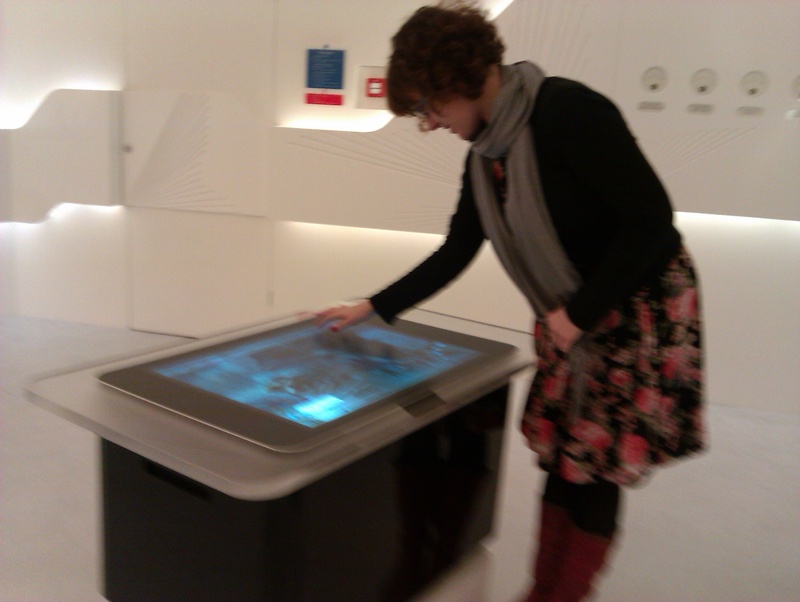 On Monday 13th Dec Terese Bird and I paid a visit to the British Library to take part in an assessment session for the Growing Knowledge exhibition. The purpose of the Growing Knowledge exhibition is to showcase ‘innovative research tools’ to researchers. The exhibition space itself provides a futuristic space for experimenting with new technologies. 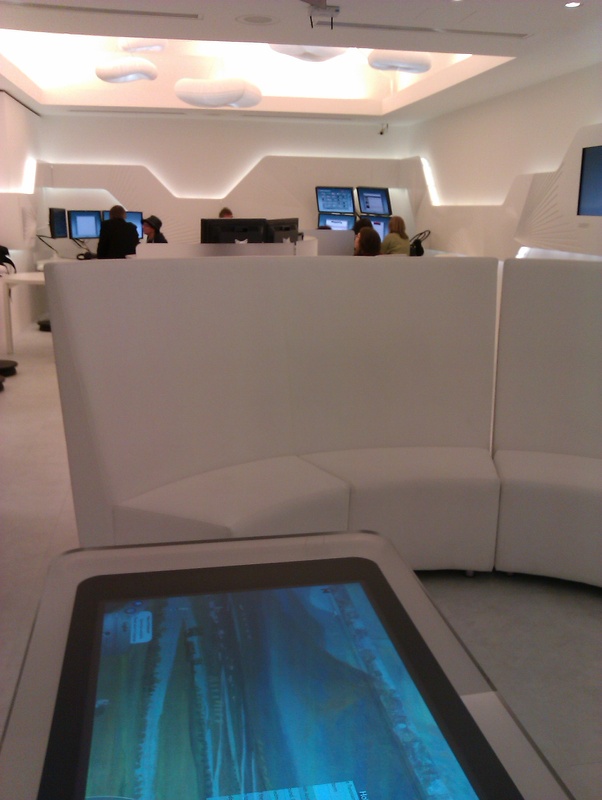 Attractions include a tweet-o-meter, computers with 2, 3 and 4 screens as well as a touch screen, and a Microsoft Surface. The idea is to evaluate how researchers are working in different ways: we’re doing more things at once, so do we need more screens to support the multi-faceted nature of research work? As part of the evaluation we were let loose to play with the research tools on this range of devices. Terese Bird and I used the touch screen computer to look at some of the academic initiatives online, including the Allen Brain Atlas, Semantic Web Applications in Neuromedicine, Jane Austen’s Fiction Manuscripts and the Journal of Visualized experiments. Each of these shows ways in which the web is being used by scholars in diverse fields for research, collaboration, visualisation and dissemination. Terese has identified the Microsoft Audio Video Indexing System (MAVIS – a software system using speech recognition technology to allow searches of audio and video files) and the Galaxy Zoo as her stand-out tools in her blog post about the day. Both of these tools facilitate research that would be arduous or even impossible without them. My own favourites were the Journal of Visualised experiments and the eDance project. JoVE leads the move toward making the communication of research more visual by presenting research methods in video format, thus “allowing the intricacies of new methods to be demonstrated far more effectively than is possible in text.” This is the kind of knowledge that really benefits from being shared in non-written media. The eDance project has developed tools for collaboration between performance and practice-led research in dance, enabling researchers to chart movements in three dimensions. While I didn’t have time to gain a full understanding of how these technologies can be used, they seem symbolic of a shift in ways of thinking when it comes to research in the Arts. The idea that description and comment can happen on the artwork itself, rather than as a separate piece of writing, surely has implications for research into any kind of visual or moving-image text. My favourite piece of hardware was the Microsoft Surface, which displayed a digital version of the 19th century Garibaldi Panorama – the world’s longest painting – and shows how the challenges of viewing and collaborating on such an artefact can be overcome. As a whole, the exhibition raises questions about the role of libraries in storing and curating digital heritage and in supporting new academic behaviours, some of which are discussed in the podcast of the British Library debate: Is the physical Library a redundant resource?